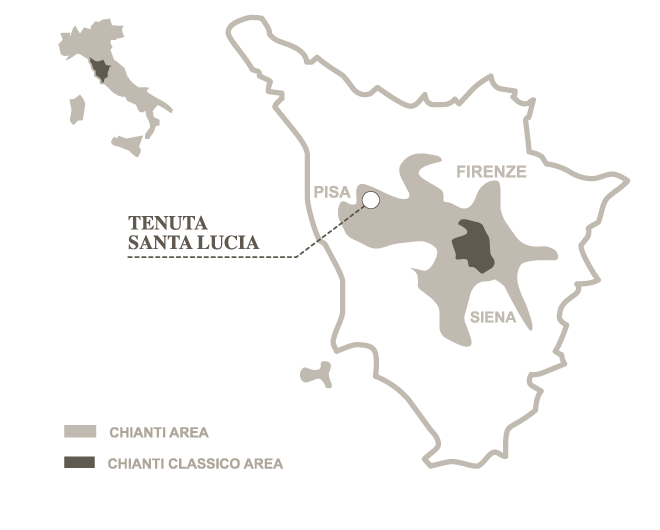 The vineyard of Santa Lucia Estate is located about 100m above sea level at the intersection of the Arno and the Era Valleys on ancient downspouts land consisting of layers of tufaceous sands and gravel; a land which reveals at times the meeting between the river and the sea, which is now located about 25 kilometers to the west, also rich in stone and fossil shells. The climate is typically Mediterranean with warm breezes coming from the sea during the day and at night channeled by the Arno and Era valleys that provide an excellent ventilation and protect the vineyard from the risk of heat waves determined by recent climate change. The vineyard is completely surrounded by woods, which sometimes it is intertwined into. This osmotic exchange with the native varieties of Mediterranean maquis allows an interesting occasional aromatic exchange and a greater richness of the interaction between the vineyard and the local wildlife. 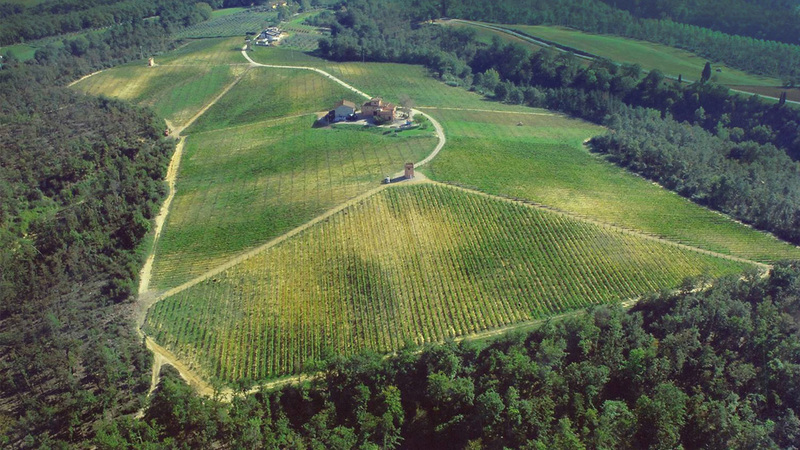 The Castellani Family has acquired this vineyard in 2013 with the aim of experimenting the growing of Ciliegiolo grape, very present variety within the estate. 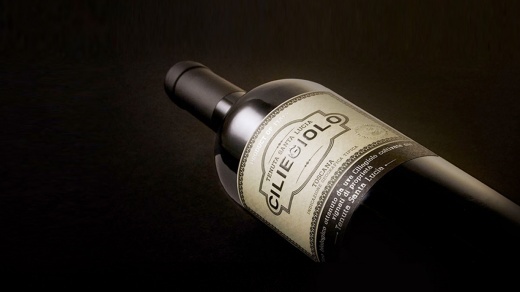 Ciliegiolo is a typical variety of Chianti and in particular of the Tuscan coast, where in recent years has collected more and more support from producers willing to give an original contribution to the Tuscan tradition. Ciliegiolo can produce wines with good structure and in some cases even power, without sacrificing the elegance and intensity of fruit. It is certainly not something new the special focus on culture by the company. So the decision to sponsor the event-show "Lettere a Extra Pontem" tied to the concept of territorial identity. 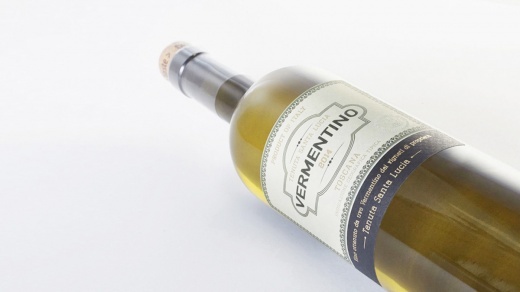 We offered a tasting of our "Santa Lucia Toscano", an organic wine that particularly stands out thanks to an innovative and "sustainable" packaging. Itself product with a strong bond with the territory. "Lettere a Extra Pontem" is a choral performance of the district "fuori del ponte" aimed to combine the realities present in the city's social environment (October 10 to 12 2014 at Pontedera Teatro Era). A final act of the project called "Extra Pontem", which began in October 2013 through workshops for students and young people, through interviews, concerts, lectures and meetings with groups and associations, to build a network of new relationships between the theater and the district where it is located, to bring out stories that enhance relationships and accentuate the sense of belonging and identity. Integral part of the project is the photographic work of Simone Rocchi titled "Faces of a neighborhood" exhibited in the courtyard of the Teatro Era. Project of Comune di Pontedera, created and produced by Fondazione Pontedera Teatro with the contribution of Regione Toscana. Artistic direction of Anna Stigsgaard. 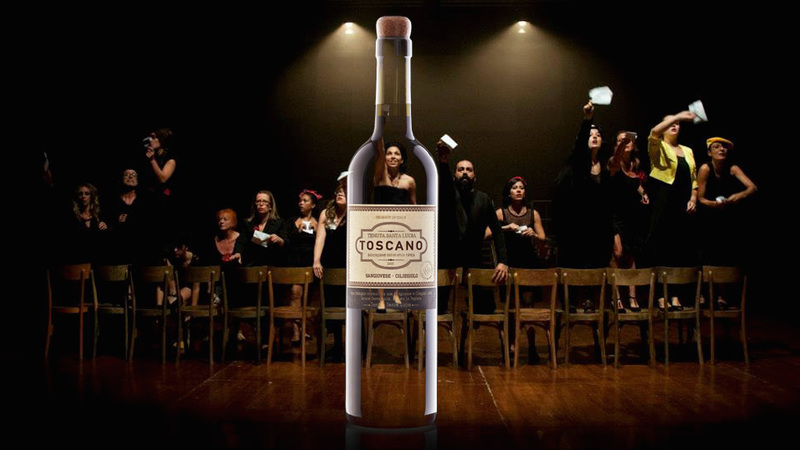 At Vinitaly 2014 we presented the "Toscano", an organic wine made from Sangiovese and Ciliegiolo of our new Santa Lucia Estate. A fresh vintage red with fruity characteristics that goes well with Mediterranean cuisine. 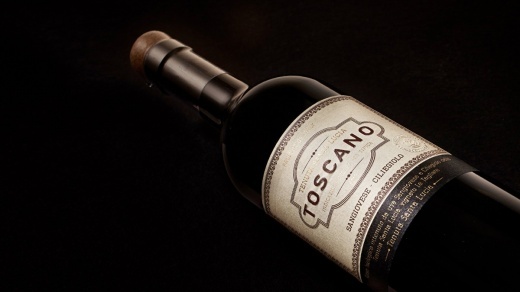 But the novelty of the "Toscano" is in the packaging that uses an original and innovative solution "twist to open" which is called HELIX™, a perfect combination between a special ergonomically designed cork and a glass bottle with an internal thread placed in the neck of the bottle that allows the manual opening, without effort, with a simple and easy rotation movement. Also, after opening, the bottle can be resealed in the same way, getting a perfect closing to preserve the organoleptic characteristics of the wine. 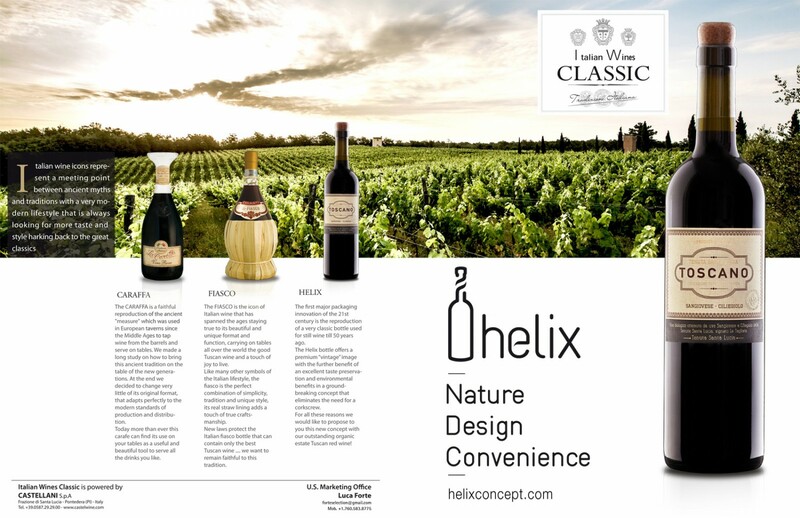 "We chose HELIX™ because it represents the ideal solution for an organic wine bottling, focusing on sustainability and reduction of energy and CO² - said Pier Giorgio Castellani, Sales Manager of Castellani Spa - We want to offer our international clients a solution of uncorking to which they are accustomed - the screw cap - with the particularity of the realization in cork which refers to the tradition of Tuscan wine. 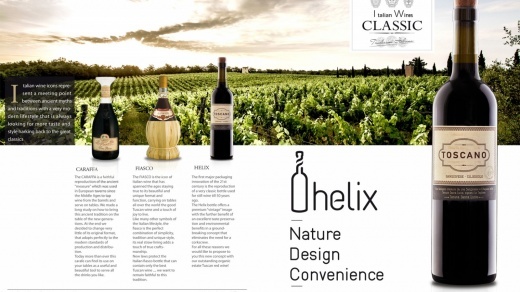 We firmly believe that in addition to the quality of the product, the packaging is also a strong element of competitiveness, of distinction and recognition on the market." It is so, a new light is kindled in the constellation of the Castellani estates. The family has in fact recently acquired a new vineyard of approximately 20 hectares in the area of the Pisan Hills. "Le Tagliate", this is its name, is located within the Santa Lucia Estate. The cultivation of this vineyard, totally of organic management, therefore, enters by right to be part of the ambitious project Castellani Bio and represents a good opportunity in the research on Ciliegiolo grape, a typical variety of Chianti grapes that is giving excellent results also in purity, especially in the vineyards near the Tuscan coast. In this regard, our aim concerns the production of a new Ciliegiolo 100% collected according to the canons of the late harvest with a slight drying on the vine. We can already say that the first vintage of this wine is producing excellent results. Completed its fermentation in fact, it comes with a excellent structure, a pleasant natural sweetness and an intense color. We are also working on the graphic design of the bottle and we expect to present this novelty at Vinitaly 2014.